During a Tuesday press conference, Mayor Rahm Emanuel lauded Illinois lawmakers’ efforts to override Gov. Bruce Rauner’s veto of a plan to reduce Chicago's payments to its police and fire pension funds. Last week, Rauner vetoed the plan that would save the city an estimated $1 billion by decreasing pension payments over the next five years, saying it was the kind of "irresponsible" practice that led to Illinois' deep financial woes. Following Friday’s veto, Emanuel said the Republican governor "just told every Chicago taxpayer to take a hike." Emanuel also said the move would lead to "the Rauner tax." 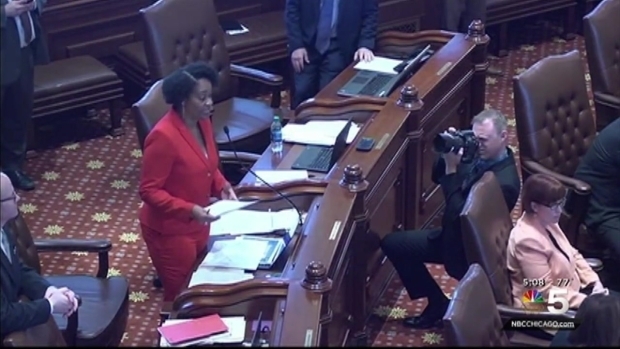 The state’s historic budget impasse dates back to last June when the Illinois House adjourned the 2015 spring session without making a budget deal. If a budget isn't agreed upon by the end of the month, it will mark the second missed deadline since Gov. Bruce Rauner was elected. NBC 5's Mary Ann Ahern reports. Rauner called Monday's override vote "unfortunate," saying the move puts an additional $18.6 billion "on the backs of taxpayers." Emanuel rebuffed Rauner’s claims Tuesday. “This is not kicking the can down the road, this is actually confronting the issue,” Emanuel said. The Legislature approved the Chicago police and fire pension bill last year. Democrats said it would save the retirement funds without crushing taxpayers. Chicago's payments to the funds are set to jump to $840 million this year, up from $300 million. The legislation would set the 2016 payment at $619 million. The deadline to pass a state budget looms nearer, with no end to the Springfield stand-off in sight. Mary Ann Ahern reports.